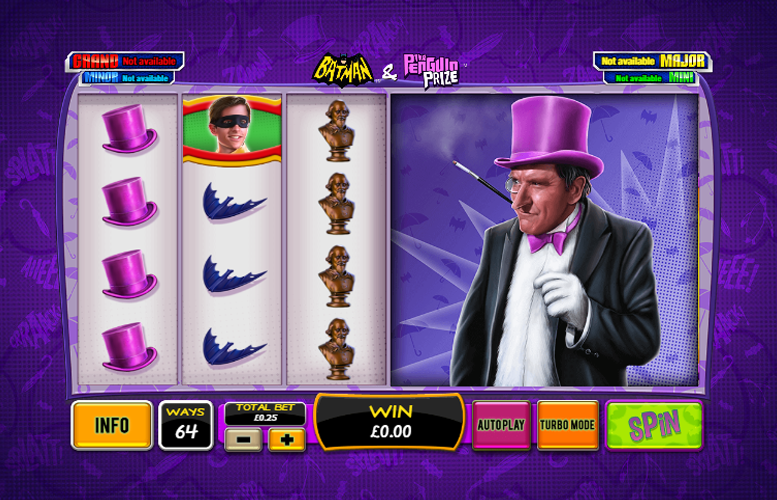 The Batman and the Penguin Prize slot machine is absolutely rammed with innovative special features. From first glance it’s apparent that this game is a little different to usual offerings. The gameboard is divided into two and half of it is seemingly inactive. When a win is dropped, a series of interesting bonuses can occur. This is box exciting and lucrative. Oh, and there is a progressive jackpot on offer. We do love progressive jackpots! Interesting approach to gameboard design. We love to see slot designers rewrite the rules when it comes to the layout of their titles and Batman and the Penguin Prize does so brilliantly. Progressive jackpot. What’s not to like about playing for huge money from a tiny initial bet? Very low main game prizes. We’re more used to seeing slots with four-figure prizes. The lowly 100x the line bet seems miniscule when compared with some other titles. Batman = 100x the line bet. Penguin = 70x the line bet. Robin = 50x the line bet. The game’s most notable feature (from both a visual and gameplay perspective) is the Peguin Respins. There are a massive 64 ways to win on this title and any single win will trigger the Penguin Respin feature. The gameboard is divided in two. The left part is a three by three grid. Players must first spin this side to see if they can land a win (three or more matching symbols). If they are successful, the right side of the grid will become active. This automatically spins following any win and the additional matching symbols may appear. What’s more, on this side of the gameboard, there are plenty of stacked symbols. This provides players with even more chances to win. If players are fortunate enough to drop a win on the first Penguin Respin, a second feature is triggered. This is imaginatively titled “Penguin Respin 2”. During this mode there are a massive 4,096 ways to win. During the second re-spin, the board is divided into three 2×3 grids. Each of these contains special super symbols that take up the space of four regular symbols in a square formation. Finally, if players are lucky and drop a win on the second Penguin Respin mode, they’ll activate a third feature. This one is called (wait for it) “Penguin Respin 3”. In this final mode, there are also 4,096 ways to win. This time, however, the board is split in two again. It differs from the first respin in that there are three by three stacks of mega symbols included on the reels. 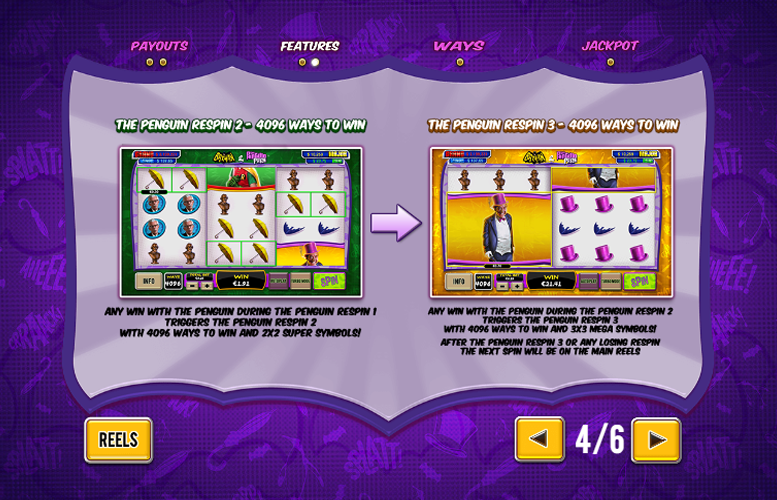 After the third Penguin Respin or any losing re-spin, the player will be taken back to the main reels. 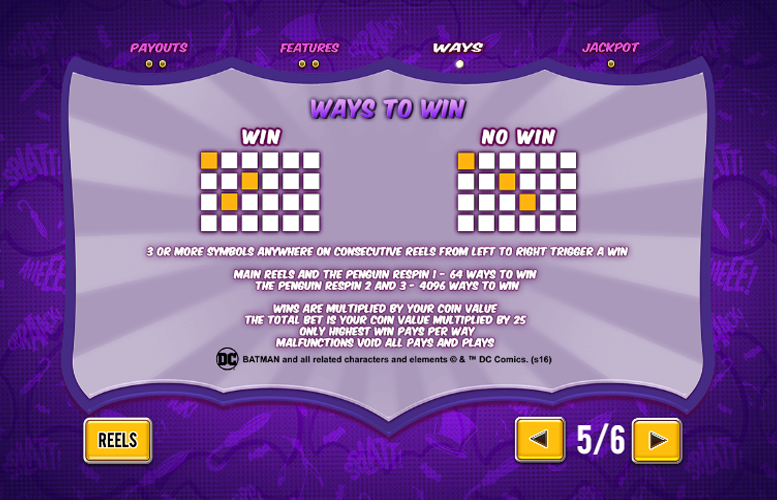 The Batman and the Penguin Prize progressive jackpot mode can be triggered at any point during gameplay. During this mode, players are given the opportunity to win a truly lifechanging sum of money. There are four different progressive prizes and one must be won on every visit to the side game. Any single spin can trigger the DC Jackpot round, but players should note that the larger the spin played, the more likely they are to be given a chance at the big money. 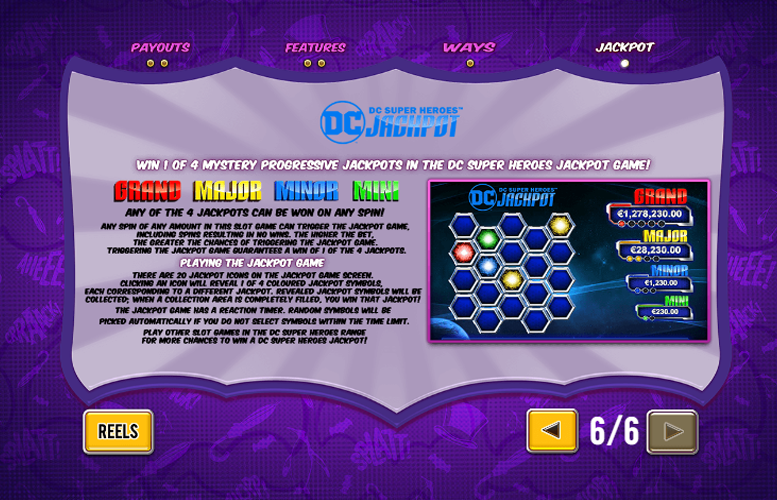 To play the DC Jackpot game, players must pick from the 20 jackpot icons presented to them. Under each one is a different coloured symbol. These are collected and the first one to fill up entirely will be the prize awarded. As mentioned, one of the jackpots must be won on every visit! Alfred = 40x the line bet. Penguin’s Hat or Umbrella = 30x the line bet. Bust or Batarang = 20x the line bet. 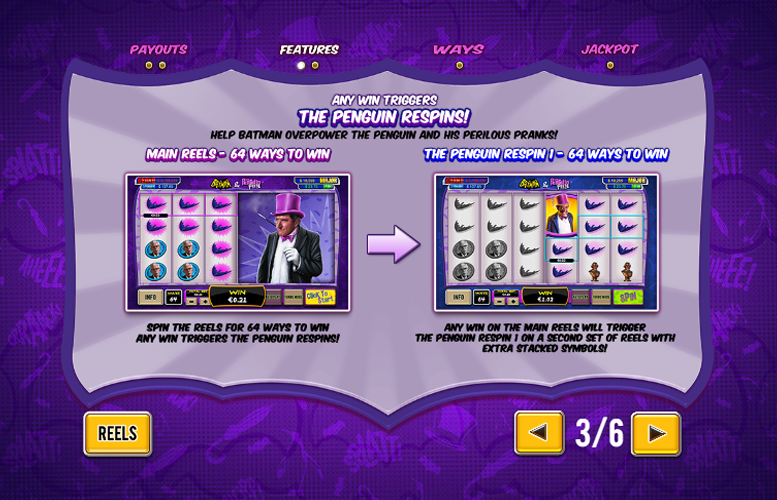 Since the Batman and the Penguin Prize slot machine is played on such an innovative gameboard, players are limited on how they can vary their bets. There is no option to adjust the number of win lines because there technically are no win lines. However, it plays as if there were 25 for the purposes of bet sizes. The only option that players can alter is the coin value. The minimum is just 1p. This equates to a lowest possible bet of just 25p. Meanwhile, the highest is £5, making the largest bet possible per spin £125. 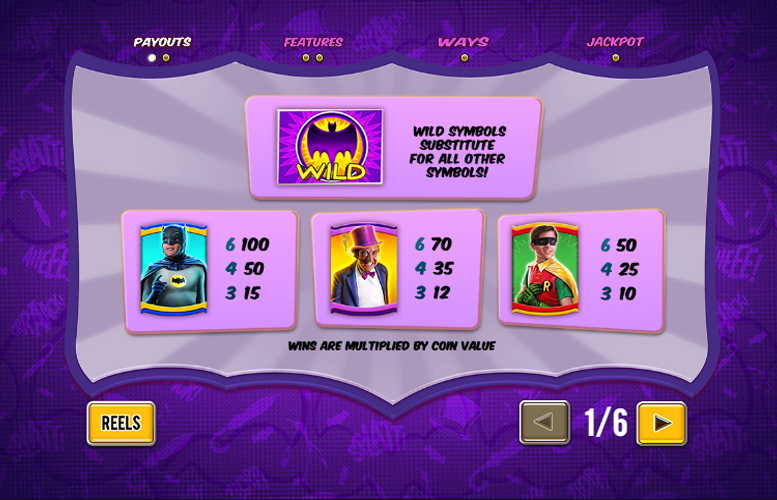 The Batman and the Penguin Prize slot machine is must-play for all fans of the original Batman TV series. There are plenty of nods to the classic incarnation of the hero throughout. However, this one will surely hold appeal to more than just aficionados of all things DC Comics. The innovation take of gameboard design and features makes it a worthy title for those less interested in super heroes and villains. Then there’s the fact that you’re playing a game with the opportunity to drop a huge sum of money from one of the progressive jackpots on offer. We think this will earn the Batman and the Penguin Prize slot machine approval from even those who have no love at all for the original TV show. This game has a rating of 4 / 5 with 724 total reviews by the users.